You might have noticed the video feature in Facebook feed. But to quench your curiosity you might have looked everywhere, but hardly failed to derive how the video can help your business. The inspirational video that you share on the Facebook helps to drive engagement and sales message as well. You can regularly have a chat over the phone messaging and put it up in front of the heart. However, for that you do not have series of quotes together with some music using a tool like. Video communication in this case can tell a story in a better manner compared to other options. 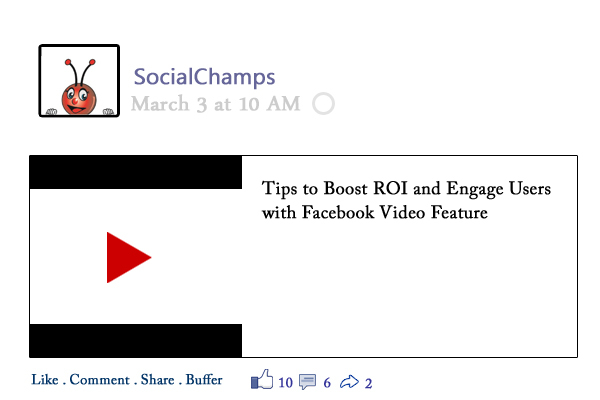 Another yet big and effective way to engage users with Facebook video includes something useful. With social channels, food recipe has become easier to note down. Even food decoration is too easy you can do it fast and with innovative ideas. People come to Facebook to have fun, but that does not mean that you will publish something completely which if off topic just to seek the attention of the readers. Featured videos are still rolling out in Facebook. When you add a featured video it become prominent and it is placed above the About section in bigger video tabs. Something that you can do with this new video feature is the way to add playlist. You can create multiple playlist, so that it allows you to control people experiences and navigation through the videos. Such as BBC network uses Playlist to feature their different show. At present, you may not find any link to a specific playlist, but in future, this Facebook feature will be there in the app. Facebook Call-to-Action button allows you to draw attention maybe a particular website on your website from the Facebook cover image. This is a traffic driver for your website. Therefore, the cover photos also have to focus on what is in the video and behind the button. You can consider the video by giving an extra boost to it by adding a video Ad If the video is inspiring or something inspiring, then you will get natural shares. A bit of ad budget will help your video to travel further. Try to keep the videos short and make it look professional with tight editing and good lighting. Make sure there are movements in the first two to three seconds to attract the attention of the viewers. As per Socialbakers brands are now uploading more videos to Facebook than to YouTube so there are high chances for your business to get the real scoop of profits. So, are you using Facebook video this year?